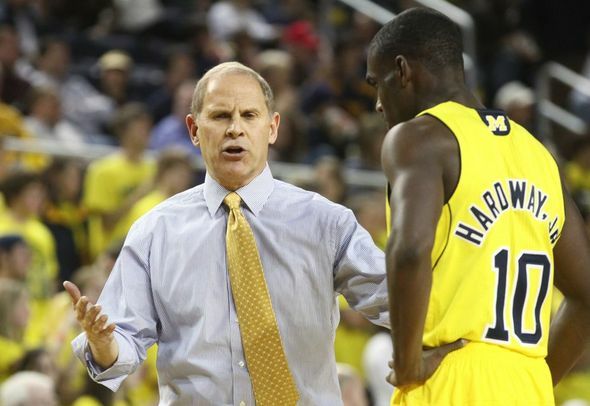 Posted on Sun, Nov 20, 2011 : 12:50 p.m.
Michigan basketball coach John Beilein instructs Tim Hardaway Jr. during the Wolverines' season-opening game against Ferris State. LAHAINA, Hawaii -- Put away your textbooks and clear your desks, Michigan basketball team. Your first test of the season officially awaits. The 17th-ranked Wolverines begin their Hawaiian adventure Monday when they open the 2011 Maui Invitational against No. 10 Memphis (3 p.m., ESPN2). Until now, Michigan has dieted on cupcakes in Ferris State, Towson and Western Illinois. Their sugar-free diet starts now. There couldn't be a higher contrast in styles here. Memphis makes few concessions about wanting to turn every game into an end-to-end sprint. Michigan doesn't mind running now and then, but against the Tigers, the Wolverines will likely have no complaints if the game drags to a creeping stop. There's little sense in denying it: Memphis is far more athletic than Michigan. That's not necessarily a slight to the Wolverines. The Tigers are able to make that claim in just about every game they play. But teams trying to out-do themselves and run with a squad like Memphis, rather than combat their speed by valuing possessions, usually end up regretting it. No turnovers, transition defense and keeping athletic guards like Joe Jackson and Will Barton out of the paint will be key. Maybe Michigan coach John Beilein breaks out the 1-3-1, maybe he mixes things up. One way or another, though, Michigan has to play a Big Ten-style game. Memphis took care of the ball in its only game this season, a 16-point win over Belmont, but with the Tigers' style of play, turnovers will happen. The Tigers averaged 15 turnovers a season ago, meaning opponents had several opportunities to get free and easy points. If Michigan creates a turnover, it can't afford to come up empty, something the Wolverines have done a nice job of avoiding to this point in the season. Michigan has forced 58 turnovers in three games and, against Western Illinois on Thursday, the Wolverines scored 24 points off turnovers. But, again, this isn't Western Illinois. Memphis will turn the ball over. It plays too up-tempo not to and Michigan's defense is too good not to create opportunities. Chances will come, but whether or not the Wolverines take advantage of them could make the difference. This basically goes without saying, and it's something Michigan has struggled with early this season. The Wolverines have shot 22-for-73 from long range with an awfully quick trigger early. Michigan can't red light its top shooters. Tim Hardaway Jr., Trey Burke, Stu Douglass, Zack Novak, Evan Smotrycz and Matt Vogrich have to shoot when open. But it has to be within the flow of the offense. The shots can't be rushed, they can't be off-balance, and against Memphis, they can't be taken in transition. If the Wolverines start clanging long misses against a team as quick as Memphis, a long rebound could turn into an easy layup at the other end in a matter of seconds. Michigan has to be more careful with its shot selection overall, but it has to be extra careful against a team as talented as Memphis. Michigan is not good enough offensively right now to shoot 58 percent from the foul line and live to talk about it. The Wolverines have been in a funk from deep and haven't exactly sparkled inside the arc, either. Meaning that when they get to the line, they have to take advantage. Hardaway is shooting 46 percent from the line, Smotrycz is shooting 63 percent and Jordan Morgan is sitting at 44 percent. The only reason the foul shooting woes haven't been more of an issue for Michigan so far is because the Wolverines' opponents have been even worse -- shooting just 47 percent. Memphis traditionally gets to the line a lot. Against Belmont, the Tigers went 22-for-34. Bottom line here, Memphis is far too good. Michigan can't blow opportunities at free points.